I know that some of you may be experiencing cooler, fall like temperatures, but not here in San Diego! We are hitting the unusual high of 90 degrees on the coast and most of us don’t have air conditioning - we rarely need it. There is no break in sight. Yes, I feel like I am melting and there is no way I am turning on my oven this week! 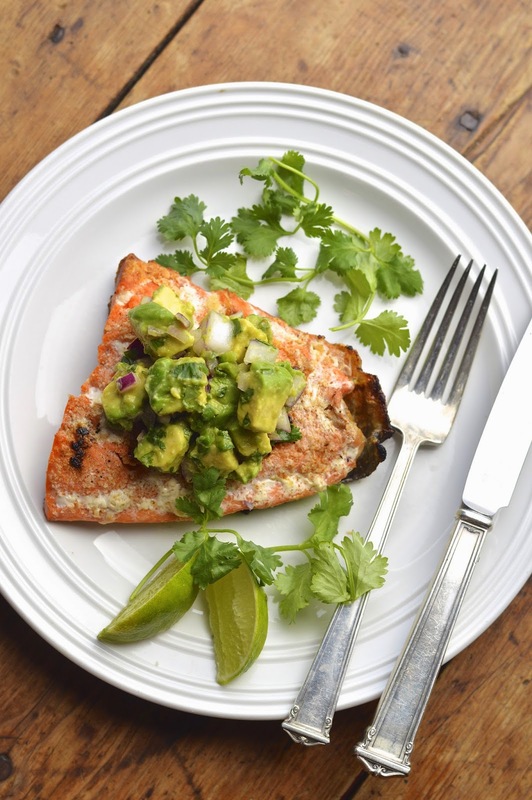 Therefore, this beautiful grilled salmon with a simple avocado salsa; no oven needed. This recipe is based on a dish from the wonderful Cookie Rookie. I made her recipe this past spring and just fell in love with the flavors and how incredibly healthy it is. It was time for me to add a few of my own tweeks and share it with you. 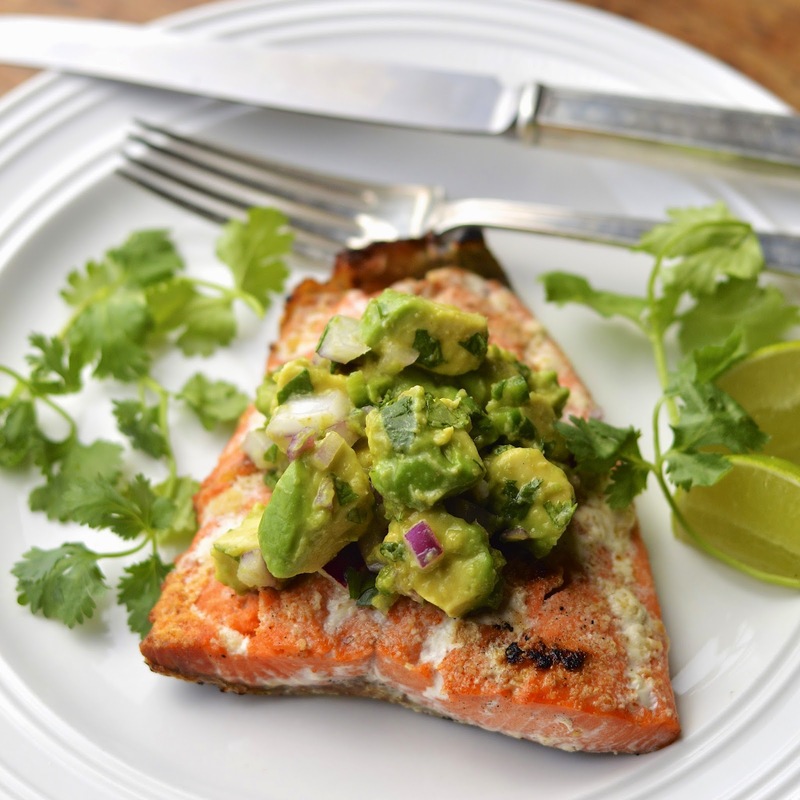 Salmon and avocado are very rich, but the addition of lime and some flavorful Mexican spices balance out these two ingredients perfectly. Oh yeah, and don’t even get me started on the cilantro. It is hands down our family’s favorite herb and turns avocado into something super special and super delicious. So I’m ready for sweater and jeans weather and actually feeling a little chilly. In the meantime, I will enjoy this last blast of summer and this perfect grilled salmon. In a small bowl mix together salt, garlic powder and onion powder. Brush the salmon filets with extra virgin olive oil and sprinkle evenly with salt mixture. Grill salmon for 5 to 7 minutes, until you can lift the salmon easily with tongs or a spatula without sticking. Turn over and cook for an additional 3 to 5 minutes for medium doneness. 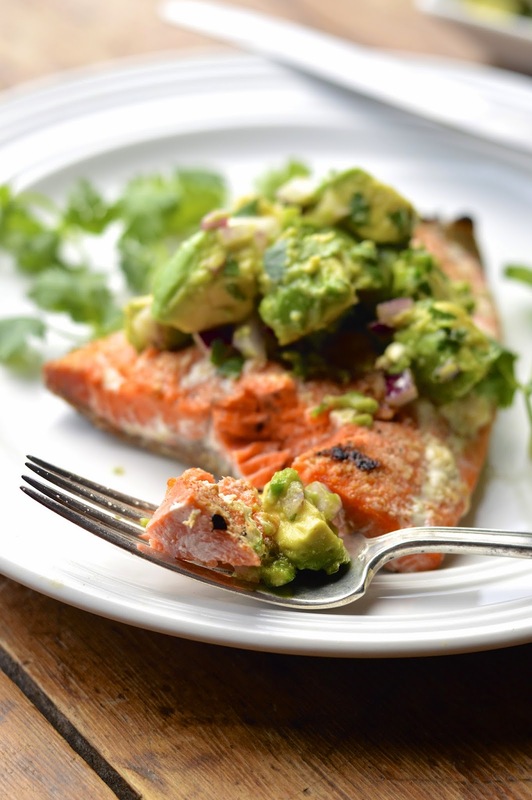 Lift salmon from the grill and set aside to rest. 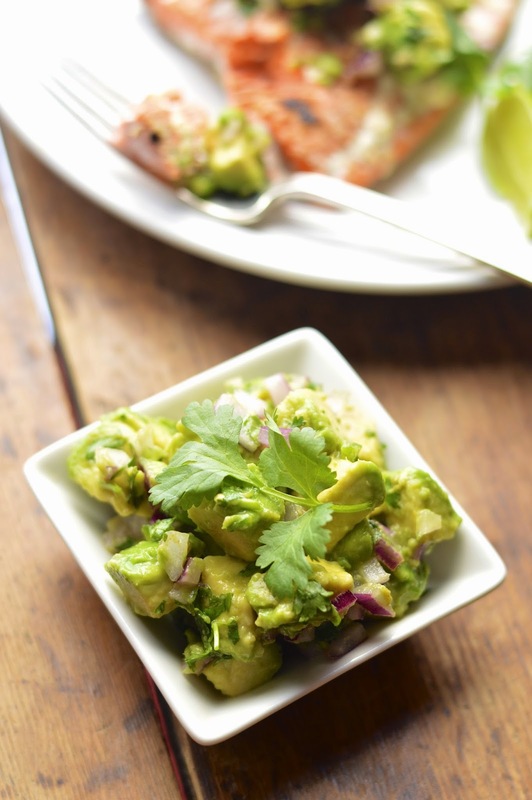 While salmon is resting, combine the avocado salsa ingredients in a medium bowl until thoroughly mixed and creamy. Serve salmon warm with a scoop of salsa on top.